Jainism is based on respect for all living beings and living life in a minimalistic way, just as the modern-day greens try to emulate. With sustainable development becoming a key word again across the globe, Jainism can play the role of a lighthouse through its well-established principles and practices. A contemporary of Buddhism, Jainism is an ancient religion in India that came into existence in the 7th century before Christ and mainly in reaction to the rigid Brahmanical Hinduism that had taken roots in India by then. Jainism preaches an ascetic battle that humans must fight against the passions and bodily senses to gain enlightenment or omniscience and purity of soul. Jains believe that just like humans, all living beings including animals and plants contain living souls, that should be treated with equal respect and compassion. Jainism calls for strict vegetarianism and the belief to live in a way that minimises their use of the world’s resources. The religion has three guiding principles often called the ‘three jewels’ – right belief, right knowledge, and right conduct. Scholars believe that Jainism doesn’t have a single founder and has been guided by Tirthankaras, or a teacher. There are believed to be 24 Tirthankaras, the last one being Mahavira in the 5th century BC who gave Jainism its present day form. The spread of beautiful temples all over the landmass of India also indicates how popular and widespread the religion had been in its heyday, though over the centuries it lost ground to a resurgent Hinduism, which beat back the challenge from both Jainism and Buddhism, relegating them both to the status of minor religions in India. There are many Jain temples in India that are known for their unique architecture and spectacular marble stone carvings. The temple at Ranakpur in Rajasthan is known for its architectural splendour and spiritual air. With its unique pillars and one marble rock that has 108 snake heads and a tangle of tails sculpted out of it, the temple is considered to be one of the most religiously important places for Jains in India. The grandest cluster of Jain temples is to be found on Shatrunjaya Hill in Palitana near Bhavnagar, Gujarat, in western India. The temple is considered holy since 23 of the 24 tirthankaras are believed to have visited this place. 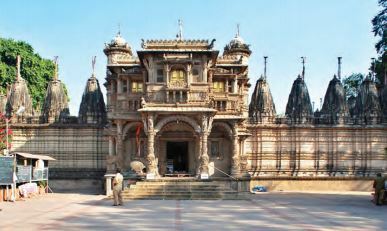 Gujarat has been a significant religious place for Jainism and houses several Jain pilgrimage centres. Similarly the small town of Kazhugumalai in Thoothukudi district, Tamil Nadu, in southern India is a very important site among Tamil Jains. Kazhugumalai has the largest collection of Jain inscriptions in south India. Constructed in rock cut architecture, the temple looks like a blooming lotus, with hills surrounding it on three sides. This Jain temple in southwest India, Karnataka, has a massive black stone structure of Gomateshwara, the first tirthankara standing nearly 19 meters tall, built in the year 981 AD. The statue is carved from a single piece of rock and is the largest monolithic idol in the world. It is considered to be the most sacred Jain pilgrimage in India. Once in every 12 years devotees flock to this temple to conduct a Mahamastakabhisheka, in which the Lord is anointed with milk, saffron paste and dusted with powders of sandalwood, turmeric, vermilion as well as gold coins. 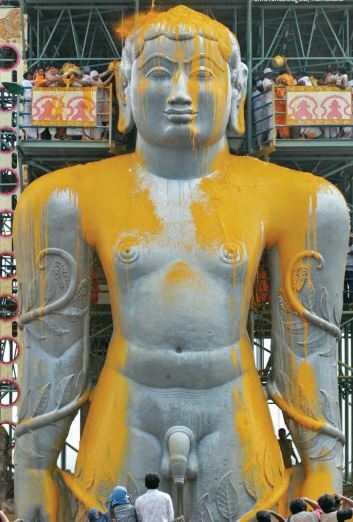 The word Shravanabelagola literally means ‘the white pond of Shravana’ as there is a beautiful pond in the town. Hundreds of monks visit this sanctuary to meditate and have made this place a tapobhumi, where people come to get deliverance. There are two other large monolithic statues of Gomateshwara in Karnataka. Located just three kilometres from Mount Abu in Rajasthan, the Dilwara temples are considered to be the most beautiful Jain monuments in the world. They are known for the stunning use of marble in its build. There are five temples in the area and were built by Vastupal-Tejpal, a Jain follower, between the 11th and 13th centuries. The temples are located in the midst of a forest and are known for their architectural perfection. People generally spend hours looking at the sculptures and the ornamental detail spreading over the minutely carved ceilings, doorways, pillars, and panels. There are five legendary temples of Dilwara namely- Vimal Vasahi, dedicated to the first Jain tirthankara, Rishabha, Luna Vasahi, dedicated to the 22nd Jain tirthankara, Neminatha, Pittalhar, dedicated to the first Jain tirthankar, Rishabha, Parshvanath, dedicated to the 23rd Jain tirthankara, Parshvanatha and Mahavir Swami, dedicated to the last Jain tirthankara, Mahavira. Built in 1848 A.D, the Hutheesing temple in Ahmedabad, Gujarat in western India is an architectural masterpiece built in white marble. A sacred Jain place of worship, Hutheesing temple draws a huge crowd owing to its divinity and is dedicated to the 15th tirthankar, Dharmanath. A significant feature of this site is the 25 metres high Manasthamba (column of honour found in Jain temples), known as Kirti Stambh. The sacred complex is topped off with a huge twelve ring semi circular dome that stands with the support of eight pillars. The dome is 80 feet in diameter and stands at a height of 350 meters. The temple has 11 deities with six deities placed in the basement and the remaining five in the main hall. Sri Digambar Jain temple or the Lal Mandir as it is popularly called is the oldest Jain temple in the city. It is an impressive red sandstone structure dedicated to Lord Parshvanath. Built in the year 1658, it was later enlarged and renovated in the early nineteenth century. The temple is built of red sandstone, hence the name Lal Mandir (Red Temple) and consists of a Manastambha column right in the front; a small courtyard that is being surrounded by a colonnade and the main devotional area on the first floor. The temple is also famous for the Avian Veterinary hospital that is run in a building behind the temple within the compound. Located in Jabalpur, Madhya Pradesh, in central India, this temple appears like a fortress housing twenty two shrines, making it the largest independent Jain temple in India. The temple has several rooms, each housing images and idols of the tirthankaras built over several centuries. An annual Jain procession on the day of Lord Mahavira’s birthday starts here. It is at this temple that 20 of the 24 tirthankaras attained Nirvana, making it a place of utmost spiritual importance among the Jains. Shikharji etymologically means ‘peak of concentration’ and is located on Parasnath range in Giridih district of Jharkhand, in eastern India. The mountain summit of Parasnath range is the most sacred to Jains. The Jalmandir temple complex in Bihar, in eastern India is a venerable Jain pilgrimage site. It is believed that Lord Mahavira breathed his last in this place and was cremated here. A huge crowd had gathered to witness the funeral of the Lord, and the demand for his ashes among the mourners was so great that a colossal amount of soil was removed from around the funeral pyre resulting in the creation of a water tank. The Jalmandir, a white marble temple, in the middle of a lotus pond marks the exact spot where Lord Mahavira was cremated. Devotees visit this place to purify their souls. The government is coming up with ideas to promote the Jain religious sites. 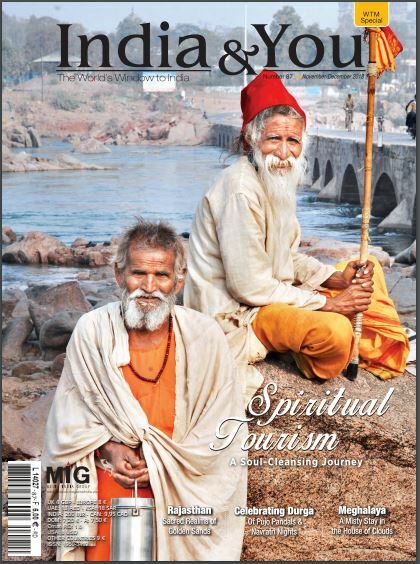 Earlier this year, Gujarat’s chief minister Vijay Rupani proposed to develop the Jain tirthankar tourist circuit along with Bihar and other state governments. In the 2018-19 budget the Gujarat government proposed INR 70 million seed fund to develop the concept of Jain tourism in the state. Gujarat and Bihar have important Jain religious places. Similarly in February the Karnataka government had organised the Jain ‘Mahakumbh’ at Shravanabelagola.